... alarm and dismay over Roy's pugilism, on the ground that he didn't want the best brain he'd encountered in a student scrambled by a well-thrown punch; but history seems to confirm that Roy came to no lasting harm over it. My nominal supervisor was a particle physicist who had no interest in general relativity. The Lorentz-covariant approximation method for the field outside a set of localized particles has been analysed. It is found that as well as the usual equations of motion and energy derived by Einstein, Infeld and Hoffman for the quasi-static approximation, there are three further equations, the equations of spin, which must be satisfied by the structural parameters of each particle. These equations also appear as surface integral conditions in the quasi-static approximation. Furthermore, it is shown that it is not necessary to expand the mass, dipole, or spin parameters, those introduced into the lowest approximation being the physical particle parameters. It is only the differential equations satisfied by these that change in the higher orders. In this first paper the equations of motion of a pole-dipole particle are calculated to the first approximation, and in the second paper this is continued to the second approximation. In the third paper the method is applied to the combined Einstein-Maxwell equations. While there I was invited to join Joshua Goldberg at the Aeronautical Research Laboratory in Dayton Ohio. There was another relativist at the lab, Dr Joseph Schell, who had studied Einstein's unified field theory under Vaclav Hlavaty. Josh was about to go on study leave to Europe for a few months, and did not want to leave Joe by himself. Before he left, Josh and I became interested in the new methods that were entering general relativity from differential geometry at that time. ... In 1962 Goldberg and myself attended a month-long meeting in Santa Barbara. It was designed to get mathematicians and relativists talking to each other. Perhaps the physicists learned a lot about more modern mathematical techniques, but I doubt that the geometers learned much from the relativists. All that aside, I met Alfred Schild at this conference. He had just persuaded the Texas state legislators to finance a Center for Relativity at the University of Texas, and had arranged for an outstanding group of relativists to join. These included Roger Penrose and Ray Sachs, but neither could come immediately and so I was invited to visit for the 62-63 academic year. 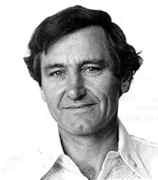 In 1963, Roy Kerr, a New Zealander, found a set of solutions of the equations of general relativity that described rotating black holes. These "Kerr" black holes rotate at a constant rate, their size and shape depending only on their mass and rate of rotation. If the rotation is zero, the black hole is perfectly round and the solution is identical to the Schwarzschild solution. If the rotation is non-zero, the black hole bulges outward near its equator (just as the earth or the sun bulge due to their rotation), and the faster it rotates, the more it bulges. So ... it was conjectured that any rotating body that collapsed to form a black hole would eventually settle down to a stationary state described by the Kerr solution. In 1970 a colleague and fellow research student of mine at Cambridge, Brandon Carter, took the first step toward proving this conjecture. He showed that, provided a stationary rotating black hole had an axis of symmetry, like a spinning top, its size and shape would depend only on its mass and rate of rotation. Then, in 1971, I proved that any stationary rotating black hole would indeed have such an axis of symmetry. Finally, in 1973, David Robinson at Kings College, London, used Carter's and my results to show that the conjecture had been correct: such a black hole had indeed to be the Kerr solution. In my entire scientific life, extending over forty-five years, the most shattering experience has been the realization that an exact solution of Einstein's equations of general relativity, discovered by the New Zealand mathematician, Roy Kerr, provides the absolutely exact representation of untold numbers of massive black holes that populate the universe. This shuddering before the beautiful, this incredible fact that a discovery motivated by a search after the beautiful in mathematics should find its exact replica in Nature, persuades me to say that beauty is that to which the human mind responds at its deepest and most profound. Everybody who tried to solve the problem was going at it from the front, but I was trying to solve the equation from a different point of view - there were a number of new mathematical methods coming into relativity at the time and Josh [Goldberg] and I had had some success with these. I was trying to look at the whole structure - the Bianchi identities, the Einstein equations and these Tetrads - to see how they fitted together and it all seemed to be pretty nice and it looked like lots of solutions were going to come out. Then I hit a brick wall. Teddy Newman and Roger Penrose were working on a similar set of methods, but Teddy had come out with this as-yet unpublished theorem that basically 'proved' that my solution couldn't exist! Luckily, my neighbour, who was playing around with relativity, too, got hold of a preprint and I just scanned through it (I'm a lazy reader) and hit the crucial part which proved to me that my solution could exist! After that, I kept working like mad and found the solution in a few weeks. The astronomers and astrophysicists had come to Dallas to discuss quasars and they were not interested in Kerr's esoteric mathematical topic. So, as Kerr got up to speak, many slipped out ... others, less polite, argued in whispers ... many of the rest catnapped. This was more than Achilles Papapetrou, one of the world's leading relativists, could stand. As Kerr finished, Papapetrou demanded the floor, stood up and with deep feeling explained the importance of Kerr's feat. He, Papapetrou, had been trying for 30 years to find such a solution to Einstein's equation and had failed, as had other relativists. Roy's style as Head of Department was at once uncompromising and dashing; in a series of moves which affronted some of our colleagues in other departments, who had grown comfortable with the traditional Canterbury view that Mathematics should be a low-cost department devoted to service teaching, he contrived to reduce student-staff ratios, encourage research, and equip the department with a computer system at the sort of cost hitherto associated with spectrographs. Morale rose markedly. In many respects Roy was an unusual figure in University administration; he had very little patience for the practice of wrapping self-interest up in politically correct pieties, and was perfectly willing to offend entrenched privilege. But he was successful, and we are the better for his efforts, and we love him for them. The Hughes Medal is awarded to Professor R P Kerr in recognition of his distinguished work on relativity, especially for his discovery of the so-called Kerr black hole. In the early 1960s Professor Kerr discovered a specific solution to Einstein's field equations which describes a structure now termed a Kerr black hole. Not only was the solution especially complex, lacking symmetry of previous solutions, but it became apparent that any stationary black hole can be described by Kerr's solution. His work is therefore of particular importance to general relativistic astrophysics, and all subsequent detailed work on black holes has depended fundamentally on it. Professor Kerr has made other significant contributions to general relativity theory, but the discovery of the Kerr black hole was so remarkable as to compare with the discovery in physics of a new elementary particle. ... for his contribution to relativity through the Kerr metric. ... for his fundamental contribution to Einstein's theory of general relativity: "The gravitational field of a spinning mass as an example of algebraically special metrics." It is particularly appropriate that the Marcel Grossman Award consists of a sculpture depicting the path of particles around a Kerr Black Hole.